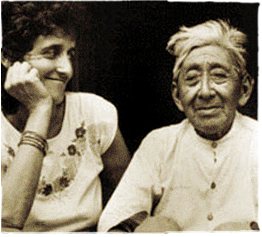 Rosita learned about native healing plants, the Maya prayers, herbal bathing for physical and spiritual healing and the ancient technique of Maya abdominal massage, known simply as “la sobada” – the massage. Arvigo watched her mentor’s deft and wrinkled hands massage thousands of abdomens with incredibly impressive results. Maya women often arrived on the doorstep of this humble clinic in groves and gaggles to have the old bush doctor massage their abdomens for relief of painful periods, headaches, tired legs, infertility and digestive upsets.